RV water damage is common with RV’s as they age. Water is quite crafty and almost always finds its way in if you give it enough time. 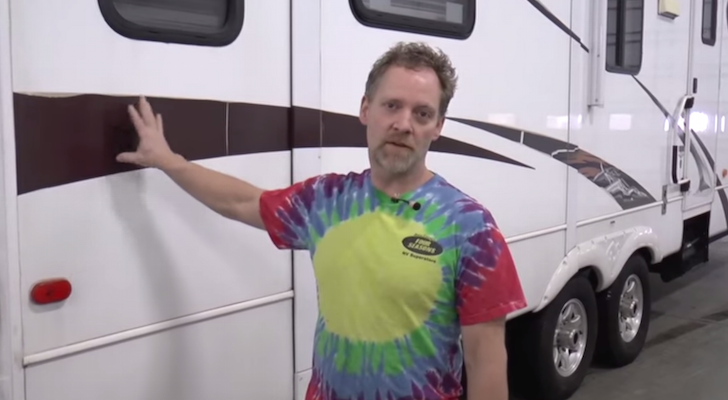 Learn more about how..
One of the most common issues with RV’s as they age is leaks. Water is quite crafty and almost always finds its way in if you give it enough time. Whether you have discovered a leak or are purchasing a used RV, its important to understand the principles of what water can do to a RV. It also doesn’t hurt to get a feel for what it takes to repair RV water damage. RV water damage is most commonly found under windows, inside cabinets and compartments, and any spot that has been pierced on the exterior of the RV. 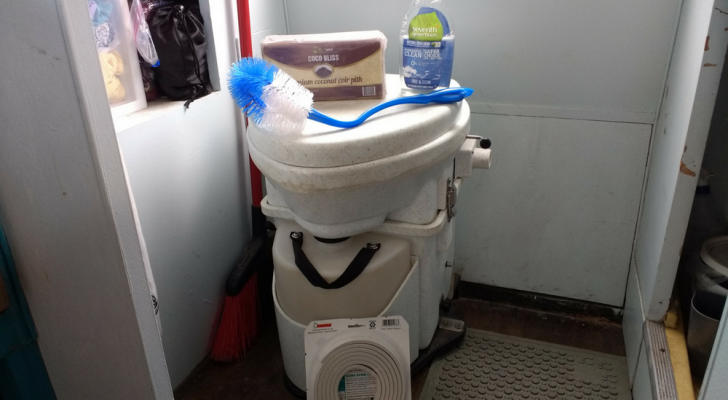 RV water damage is a silent killer of sorts. You have to keep a sharp eye out for it. Look for stains, delamination of fiberglass, dark colored wood, and bumps/bubbles in the paneling. If is just a small area then it can typically be contained and repaired without too much trouble. If the water has affected the wall or floor structure of the RV then it gets a lot more messy financially and from a labor standpoint. The rule of thumb generally says that minor water damage can be fixed and large scale water damage is more likely to cost more than the RV in some cases. For small repairs there are new products coming along all the time to assist with repairing water damaged wood which is the main cause of failure from water damage. 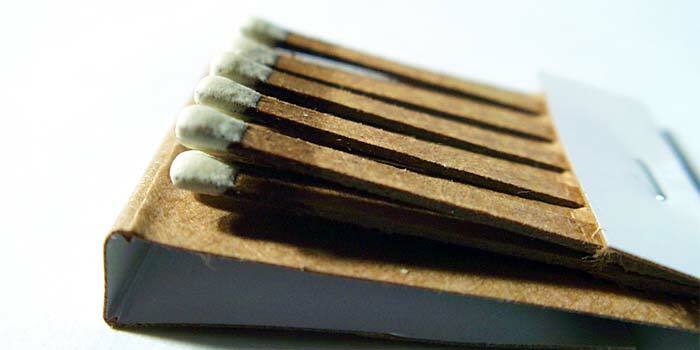 For example there is Elmer’s Damaged Wood Repair which is designed to refurbish water damaged wood without the need to do an expensive replacement. There is a great video below that I encourage you to watch. We came across it while assisting a reader with a RV water damage repair. Not only does it do a great job of showing you the damage that water can do to an RV, the creator also shows how to repair the damage step by step. Now this repair was done in 2011 to a Fleetwood Prowler 275N Fifth-wheel travel trailer, but the principles still apply even if you have a motorhome or fiberglass exterior. We hope you never have to experience the sinking feeling of discovering water damage in your RV, but if you do this video will come in handy regardless of if you decide to do the work yourself or have it done professionally. 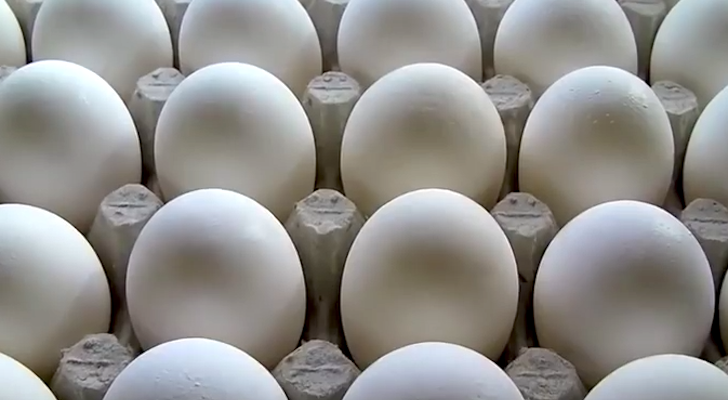 You should get a great idea of how labor intensive the process is from the video above. 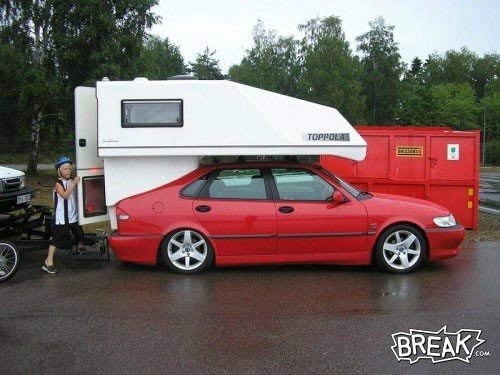 To be sure you never have to, you may want to read the Gypsy Journals take on protecting yourself from RV Leaks. If you have any stories or pictures of RV water damage that you have personally dealt with please share them in the comments below or by using our new idea submission system. I read dry rot, not mold…. I have a 1997 Terry fifth wheel/fiberglass exterior with 14 foot slide. Have dry rot on the sides below the floor line and wheel well area. The fiberglass looks like it is spliced @ the floor line. 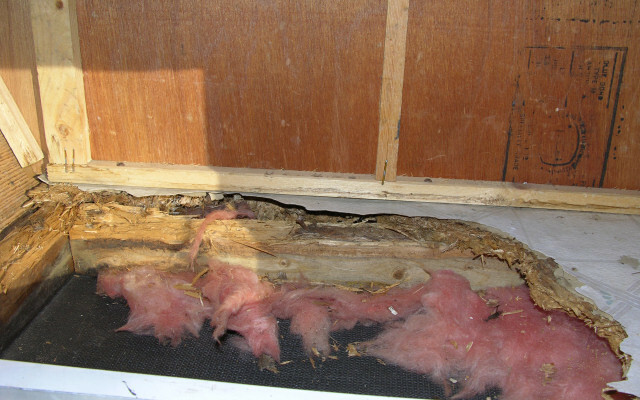 Can the fiberglass be removed to get to the dry rot area? It feels like it’s wrapped in some type of cloth. Thanks for any information. I have a 2006 coachmen 272tbs Ruby edition we bought new in 2008. Picked up from storage facility today. Found floor soft in front of toilet. Found wrinkled ceiling that feels soft on drivers rear near shower. Think I have a leak from up above somewhere. Will be up later today (2am right now) and check the roof from a tall ladder. I’ve noticed the soft flooring comes forward from the back corner into the rear 1/4 section of trailer in front of bathroom. 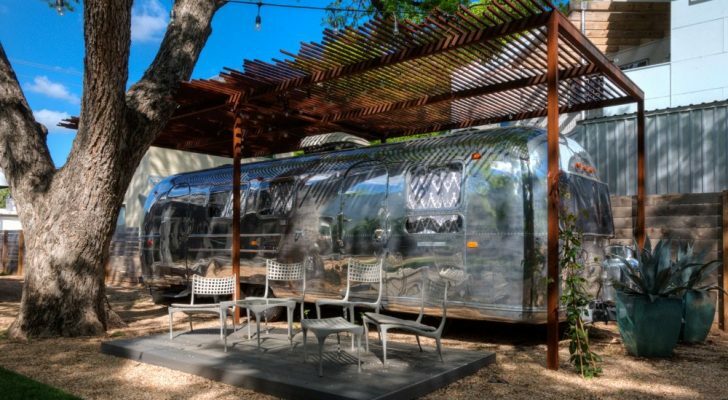 Is there any videos or processes showing how these fiberglass sided trailers are put together? I know it has a Alum frame on each side and was touted as being lightweight which is one reason we bought it. I’m sure I’ll have to drop black water tank as it’s directly below soft spot in bathroom. Also while checking under bottom of trailer I noticed the black insulator protector webbed paper on bottom underside of trailer feels mushy like it might be wet above where floor is but under the floor tile in trailer. Any ideas, suggestions, web pages, videos, links, resources, materials to use for repair if a roof leak, materials and places to get them to get trailer back to O.E. spec so I can get this repaired myself if needed the right way as paying to have it done will be expensive. I will check with insurance company and see what they say. Wondering if something like this can normally be covered under homeowners coverage under other buildings, etc? I’ll be checking with auto and homeowners insurance as I know trailer is fully insured. IF insurance wants to buy it I’d be fine as well as the trailer has been maintained with nothing else wrong with it. 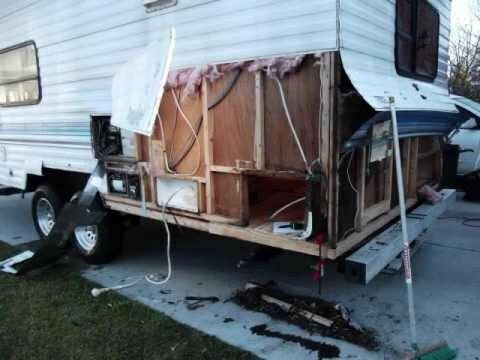 Here’s another post that might help http://www.doityourselfrv.com/replace-rotted-wood-flooring-travel-trailer/. You could probably cut out most of the damaged wood first and use some mold killer and epoxy resin to stop the existing wood from continuing to rot. Thanks for the great info. I have a 2004 wilderness Yukon 829s that needs a new floor do to a vent that broke during the winter. Do to the expense of having it done I wish to do this my self with some help from a friend. How much of the interior do I have to remove and what can I cut around? Sorry to hear about your water damage. Hopefully you have found the leaks and repaired them already. If so, then it is hard to know exactly what the extent of the damage is on the ceiling. If you could grab a photo(s) of it and send it over that would be a big help. 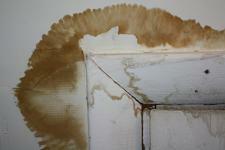 Send it to admin at doityourselfrv.com with the subject line: Water Damage on the Ceiling. We will have Danny D and a few others have a look to see what we can do to offer a fix. Thanks! Without seeing what your project/repair entails. The video shows the plywood coming in from the outside for ease of installation. You could bring it in through the door but it will be very tough to move around. Hope that answers your questions, if not please provide a few more details and we can give it another shot! great video. thank you! Do you always have to put the plywood flooring in from the outside? I just discovered a soft spot in the lower corner sidewall and floor, and will need to to some work once it stops raining (Seattle area, could be a while). Try starting with bottled hydrogen peroxide (3 percent), the kind dentist may say to gargle with. Put it in a spray bottle and then spray it on. Oxyclean Carpet Cleaner is highly praised by others in your situation. 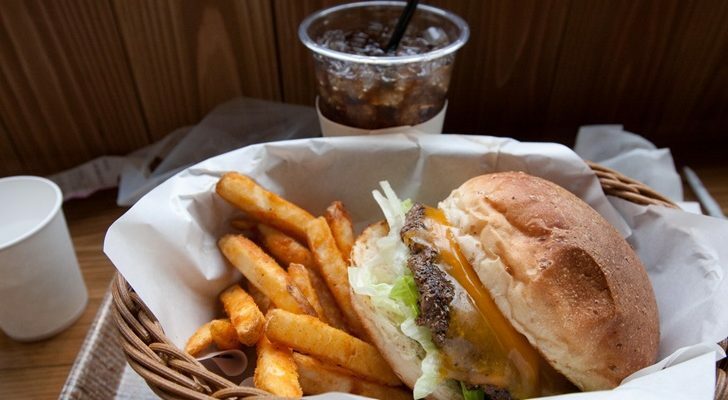 It contains a dry form of hydrogen peroxide. After that you can try plain white vinegar. Spray it on in a spray bottle. These two substances combined have the germ/mold-killing power of bleach without the bleach. We have water damage on the cloth ceilings I our motor home. Any ideas on how to clean this? Thanks for sharing your story. Sounds like a very interesting project! If you get your blog up and running please let us know, we would be very intersted to see how things progress. If not, you can send us over some photos with a description/details and we can write a post up on our site to show off the fruits of your labor! I have been removing the interior on my 66 Trophy 26′ trailer since last spring and finding all sorts of surprises in the water leak department. Things are down to studs now and I am dreading pulling the flooring (all 6 layers of it) to get a clear picture on the joist problems. There is a lot of damage already so at least it can only be a positive surprise if there isn’t as much as I expect down below. I did get this camper as a fun challenging project though, so bring it on! I am looking forward to getting the old rotted wood out and the new and more supporting framework in so that I can continue giving this old camper a new lease on life and learning a lot myself. I am looking at making a blog to chart the progress as well in the near future and any comments would be greatly appreciated! On my 86 Jayco 26 ft Motorhome my floors on the drivers side were gone. I went to the joist that runs down the center and cut it out. reinforst all the joist’s that were there. I have been working on this for about 2 week.Now I am down to the back end and I got to pull the tub and shower.and I know the frame is mush worse there because my gay water tank fell out once it is right under the tub. I wil problly replace the whole frame there. We are really glad you found it as well! Had a look at your website, wow that is a serious undertaking. I plan to check back to see your progress and I might write a post showing off your work if that ok with you!